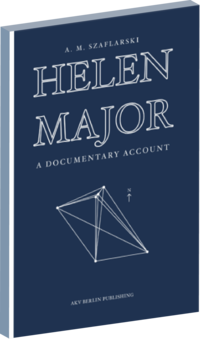 Helen Major is a non-fictional account. The adventure began in August 2008 when A. M. Szaflarski placed ads in the classifieds from the Vancouver Sun, and The Province Newspaper. The ads varied from week to week, but essentially were a call for informa- tion about ‘secret locations’ in Vancouver and were intended to function as a platform for a series of interviews. Ambiguous as the ads were, there were few responses and only one person persistently expressed her interest; a woman that called herself Helen Major. The direction of the project takes an unexpected turn when Helen misses all of her scheduled appointments with Szaflarski, and turns the project into a detective story.